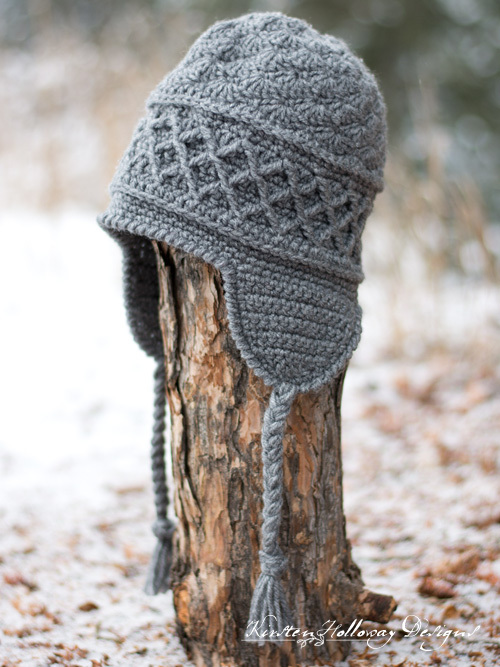 Keep cozy on the slopes this winter with this versatile crochet ski hat pattern! The double layer diamond pattern provides extra warmth, and if you use a larger hook, you could even line it with fleece or fur. There’s almost no end to the customization you can do to make the Snow Country Ski Hat uniquely yours! 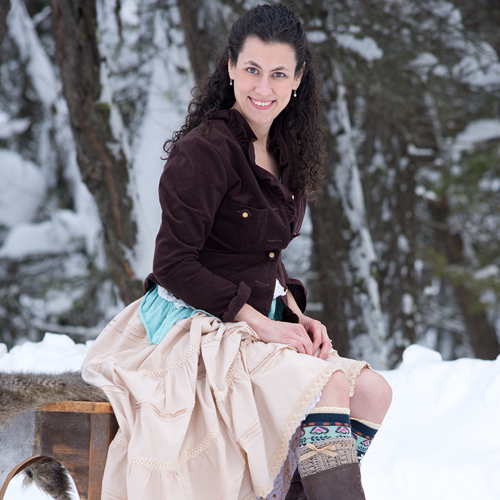 Due to the popularity of this ski hat I’ve also designed a super scarf with the same stitch patterns that you can find here. Keep scrolling down for the hat pattern. **Please note** This pattern begins with part of another pattern from Crochet Geek. The links to the website and instructional video are below. You will need to be familiar with working a shell stitch to do this first part. This is not a beginner/easy pattern. 8.5” tall and 10.5″ wide (excluding ear flaps/ties), and should fit a teen or adult. If your hat is coming out small go up a hook size or two. -A special thank you to Crochet Geek for kindly giving me permission to share their video instruction for the top part of this hat. -To work this pattern you must be familiar with the Diamond Stitch, the Shell Stitch, and the Reverse Single Crochet, or Crab Stitch. Click on the links to view some excellent tutorials from Moogly, and Hopeful Honey on how to work these stitches. You must also be familiar with working in the 3rd loop of an hdc stitch. -Finished hat should measure, unstretched, about 8.5” tall and 10.5″ wide (excluding ear flaps), and should fit a teen or adult woman. Rounds 1-10: Please follow this video from Crochet Geek for the first 10 rounds, or follow the written instructions on her blog. You will need to be comfortable with intermediate to advanced level patterns. You may also need to go up a hook size or two! Note: I tend to use a bit more tension on these so the stitches are tighter to better keep out the wind. sc around the edge of the hat. Join with sl st to first sc. Working in the opposite direction, ch 1, reverse sc (or crab stitch) around the edge of the hat. Join to first reverse sc. (Optional) Cut 6, 24″ lengths of yarn for a tassel. Thread through the top of the hat and braid. Knot at the end. Cut 9, 24″ lengths of yarn for each tie. Thread through the bottom of each earflap, braid, and knot off. This crochet ski hat pattern was made to be used by individuals, and small business crocheters alike. Selling your finished pieces in boutiques, at farmer’s markets, craft shows and other events is encouraged! Please credit/link Kirsten Holloway Designs when selling finished products online. The only thing I require is that this pattern not be used commercially to produce millions of copies. Thank you for sharing such a beautiful pattern!! Gorgeous hat, can't wait to try it. LOVE LOVE LOVE! Thank you! ? Are the instructions for row 12 cut off? I can't figure out what I'm supposed to do. It did thanks so much! I have a question on rnd 14…is there supposed to be 3 sc between each FPTC2tog? Yes, looks like that was missed in my update this morning. I'll go fix it! I am a huge pinner, I have to say I was so thrilled to find this free pattern and it is my FAVORITE hat pin. So a huge Thank You , hope to see more of your posts! So a huge thank you! Keep up the good work!! Struggling with round 14. Not quite getting where to put the second part of the FPTC2tog.. I'll check my hat in the morning to make sure, but I believe you're correct. You'll skip 3 stitches from round 12, and work the second part of the stitch around the 4th sc. Yes, the second part of a FPTC2tog should go around the 4th sc over. I'm struggling with 14 as well. Do you have a video of these steps for your hat? I tried the video you suggested but it isn't helping with your steps. I ended up completely ignoring the written instructions for this round. 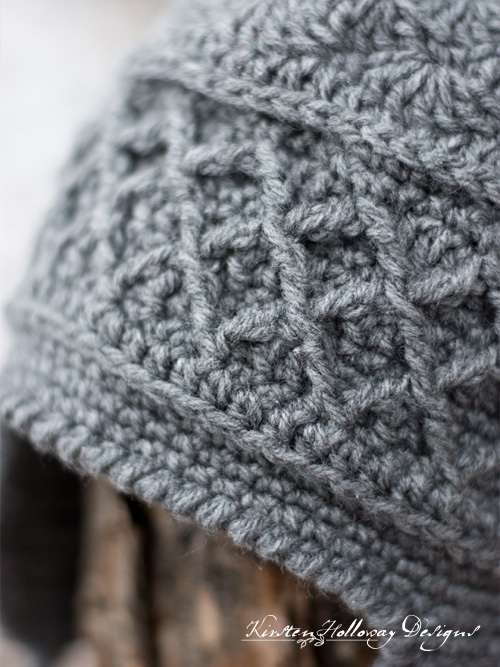 I simply couldn't make them work for me….I followed the video she mentions in the pattern for this entire section of the hat. Went back to following the written instructions once past this section. I think I got it, thanks. Turns out I ended up with the wrong video for doing this stitch. No idea how that happened but its so simple after watching a doing a couple stitches. Happy to move forward ? Glad you both got it figured out! I plan to do a video tutorial for this hat in the next few weeks,so hopefully that will better explain things. It's difficult to write out the split of working in two different rounds at once! I'll try that Kristina, thank you. I made this for my youngest son and he loves it! Thanks so much for the creative pattern. I have been looking for a pattern for an earflap hat for months for him and this was the one. I am starting a second hat for my 30 year old daughter, I am going to convert the pattern to a messy bun hat. I have started the pattern on row 3 and am crocheting the 8 shells on a hair elastic. Can’t wait to see the finished project. I will have to make a matching one for my 2 year old grandson. Love love love, from Kamloops bc!! I’m glad you’re finding this hat so versatile! Originally it was intended as a ladies hat, but many have been making it for the men in their lives. It’s good to know your sons will approve! 🙂 Happy crocheting! How would you make this smaller for a 12 month? Thanks, I didn’t know if you could decrease by so many stitches and still come out right. Made the La Vie en Rose Earflap Hat and it is absolutely adorable! You’re welcome! I have not really played around with increases or decreases with this since the top of the pattern comes from a different site. I’m glad you liked the La Vie en Rose hat too! I am really struggling with round 14. I’m ending up with 3 FPTC’s all in a cluster (I’m doing 1 FPTC, then the first part of the FPTC2Tog in the same stitch, then the final part of the FPTC2Tog in the next stitch over). When I look at the pics of the finished product it just doesn’t seem like there are 3 stitches all together like that but I keep re-reading the pattern and I don’t understand what I’m doing wrong. Help?! You’re working on 2 separate rounds in tbis round. Watching a video may ne helpful to understand whats supposed to be happening. that video doesn’t take me to the stitch video but a quick books video. Is there a tutorial video ? Hi Pat, I’m not sure which link you are referring to. I clicked on them this morning and they all took me to the correct videos. Will this pattern fit an adult man? Would any alterations be required to make it fit? thank you kirsten for being so kind as to share this beautiful hat. Your creativity is amazing. You’re very welcome, Paula! ? This is a beautiful pattern but I have trouble with row 14, i dont know where to place my crochet hook. Any advice? Thank you! You will be working stitches around round 12, two rows down so to begin you’ll find where you joined round 12, count forward two stitches, and begin your first front post treble crochet around that stitch. Thank you so much much for sharing this beautiful work! I am not that experienced but would just LOVE to make your hat. Are you ever going to make a tutorial of this hat. Pleaseeeeeee. ? This is very beautiful, thank you for sharing, Kirsten! Thank you for sharing.Love this hat. My friend made this hat and I fell in love with it immediately and had to make one for myself. I enjoyed learning new stitches, the crab, working in the third loop only of the hdc to produce patterning on row below and especially the diamond pattern. Had tried to get to grips with forward post stitches before but not successful. The patterns were complicated for a first try but this was a nice introduction to doing them. Looking forward to doing the finishing touches on my hat this morning then adding to my blog. Will be sure to send everyone over to your site when I mention you in my post.